We had 20 of these small Redfish, great to see a comeback! Tarpon at one of the spillways at Flamingo! Another small Redfish, lots of them this week! This is an 8 foot Sawfish and those are his teeth! This past week the rain was gone and the fish wanted to eat! I have been fishing the Back country and Gulf of Mexico for the last few months. 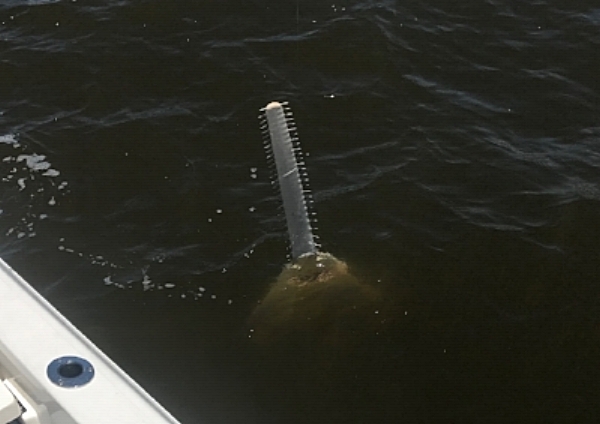 I launched on the Fla. Bay side a couple times this week and found fish. I at Flamingo with good friend and accountant Fred we found some Tarpon out front in dirty water and couldn't get them to eat our lures and after an hour we moved on to catch the falling tide. 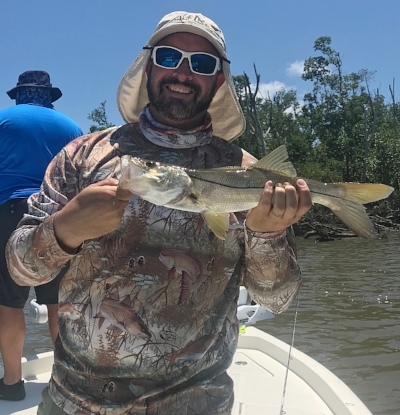 It paid off with a constant bite of keeper Trout and juvenile Redfish. It was a double up on every cast and after 20 Reds and 30 Trout we left them biting. We bounced around looking for Tarpon and Snook along the coast. We had shots at Tarpon but no takers but did manage a 26 inch Redfish and some big Trout. We continued north and found more Snook, Fred had a couple up to 8 lbs. We did have a few eat our baits but got us into the trees. We put allot of fish in the boat and it was time for a cold beer so we headed home! I am with Matt, Leon and John down at Flamingo, we launched on the Fl. Bay side. I tried the same pattern as a couple days ago but was to early and tide was wrong. we made our way out to East Cape and I saw a few Tarpon rolling at the dam. We got up there and immediately had 3 hook ups. by the time we left we had 3 caught and 7 or 8 hooked and jumped. I netted some mullet and put them to work while I had them throwing Gulps. 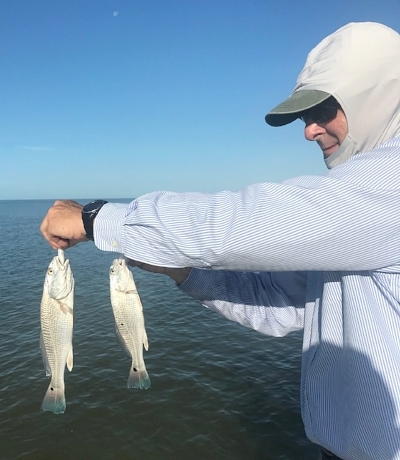 John caught a small Redfish a while the others caught Jacks, Ladyfish and Trout. We got on a few Tarpon but we couldn't get through the Ladyfish. We ended the day with a pretty good Snook bite on live Mullet. John got the first one and then Matt caught one and then it was back and forth for a while. Leon was just relaxing when the big rod in the back was doubled over. Leon picked it up and fought the fish for 20 minutes, he asked what is it. I explained it was an 8 foot Sawfish they are really cool and pre historic! It was a great day and it was time to go these guys were excited about their catches! Fishing is good and will be getting better in the next couple weeks. Caught Lookin Charters is kid and family friendly charter company. If you are interested in a fun filled fish catching day give me a call at 305 333 8149. Newer PostTake your Kids Fishing! Older PostFishing has been allot of fun!